Given Portugal's recent win of the Euro Cup, I felt it only appropriate to shed some light on the beautiful country itself. But before I jump in, Congratulations Portugal! 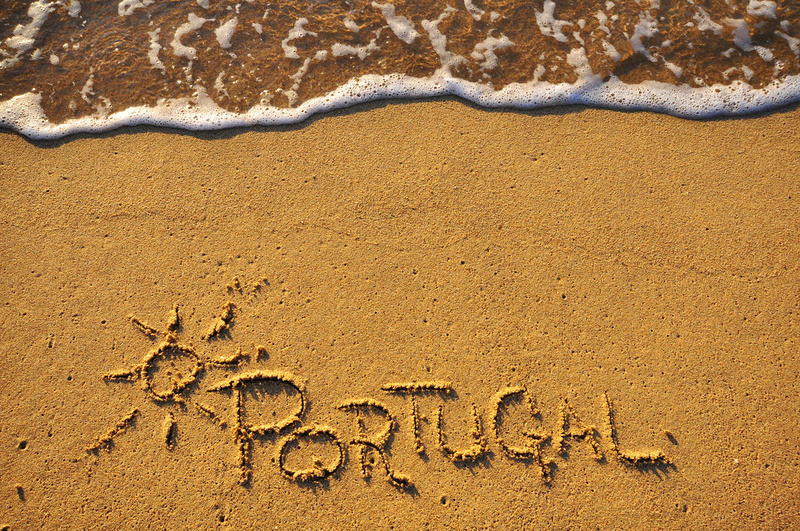 Portugal, the magical Southwestern European country that's bordered by the Atlantic Ocean and Spain. A country that boasts cities with diverse attractions from ancient to contemporary, colorful medieval fishing villages, cultural diversity, rich architectural heritage, charming seaside towns, green luscious landscapes, impressionable rivers, and a coastline that will leave you fully relaxed. And then there are the Portuguese people. A culture that is welcoming to all; kind, charismatic, generous, and loyal. I say this, not as someone that has a Portuguese heritage, but as one that has lived in Portugal for seven years. I have experienced it first-hand. If you are planning a trip to Portugal - or considering it - I would recommend at least three places to visit. The first is Lisbon, the seductive capital. Second is Porto, the majestic port city. And the third is an entire region, Algarve, which is the home to some of the most stunning beaches in the world. I kid you not - look it up! Stunning. Lisbon, a city of culture, romance, and vibrant energy. Some of the most beloved districts of Lisbon are filled with graffiti-ridden facades that are homes to tourist-packed fado houses, restaurants, boutiques, and a multitude of bars. Some districts so elegant and sophisticated. And some that display the influence of Portugal's history in architecture, interiors, and even colors - spots where Prince Henry the Navigator, Vasco da Gama, and Magellan stood with dreams of discovering the world. So much beauty in Lisbon and so much to enjoy - it's a city that caters to all. A city that will not disappoint. Below is a breakdown of the districts. I would highly recommend checking out the Estoril Coast - called Linha do Estoril which is west of Lisbon. It's a beautiful scenic drive along the coast with miles of beaches and breathtaking architecture. If you prefer public transportation (highly recommended here), there is a train that runs along the Estoril Coast and you can hop on and off to check out the sites. Such abundance in this area with no shortage of cathedrals, monasteries, boardwalks, beaches, bars, and nature spots. Whatever you prefer to explore, you will certainly find it along the way. Cascais is on the Estoril Coast which is another MUST see! Spectacular beaches, restaurants, historic landmarks, and the famous castle, Castelo de Sao Jorge. Costa da Caparica is a popular beach spot. Very nice. But if you are looking to ride some waves, then Ericeira is the best surf spot in Portugal; and one known in the world of surfing. A city that is culturally diverse, with churches and monuments, and the region well-known for it's Port and Douro wines. The River Douro, seen in the above photo, runs between Porto and Vila Nova de Gaia - the river is breathtaking. I have yet to spend some time exploring this magical city, sipping wine while overlooking the spectacular Douro Valley and it's vineyards. Imagine waking up to the below for even a day? Move over Napa. A few attractions to check out if you can pull yourself away from the above view. Algarve has some of Europe's most beautiful golden beaches. It's also a golfing paradise with views of clear blue waters, and breathtaking scenery. From the Eastern side near the Spanish border, all the way to the Western Algarve is marked with spectacular sandy beaches and historic towns and fishing villages. Some of the most historic towns are Sagres, Faro, and Lagos. The western part of the Algarve is magical - less crowded also; so if you are looking to get away from the crowds or looking for a secluded cove, head West. Odeceixe is worth getting to. It's north of Sagres and one of Algarve's best kept secrets. Award winning resorts can be found in Vale do Lobo, Quinta do Lago, and Vilamoura. I actually spent years of my childhood in these three areas - just spectacular! A very relaxed beachy vibe and there is a nice marina that is worth checking out, particularly for any boat lover. If you are in search of that beach vibe with a bit more action, then head to the tourist mecca, Albufeira. Albufeira has some of the most famous beaches and has a fun party scene. Waterslide Parks have become quite popular in Portugal since the early 80's. In fact, my dad built some of these waterslide parks. The two that are still going strong today are AquaShow which is located in the Vilamoura and Quarteira area and then there is Slide & Splash in Lagoa. Slide & Splash is the best-rated one by TripAdvisor which is awesome. Clearly, makes me proud even though it is no longer owned by my family. Before I sign off, here's a list of the top 10 beaches in Algarve. Two of the most famous and popular are Praia da Oura in Albufeira and Praia da Rocha in Portimao. One of my childhood beaches was Praia da Falesia which is located between Albufeira and Vilamoura. It's six kilometres of golden sand and cliffs. Simply breathtaking. But again, any beach in Portugal is pretty spectacular. If you have any questions or would like to add to this post, I would love to hear from you. © Ava+Mum 2016. All rights reserved.